This is a great time of year for fruit in FL. The best fruit right now is strawberries and they basically kick off months of really fresh fruit. While I will eat fruit in pretty much any form, sometimes it's nice to have something to dip it in for more of a dessert feel or if you are bringing something to a party. This dip isn't the healthiest thing in the world but it is so good... plus you're eating it with fruit! Combine all the ingredients in a food processor until smooth. Serve cold. You can also add some orange juice concentrate if you want a more fruity tasting dip. Choose some of your favorite food and dip away! 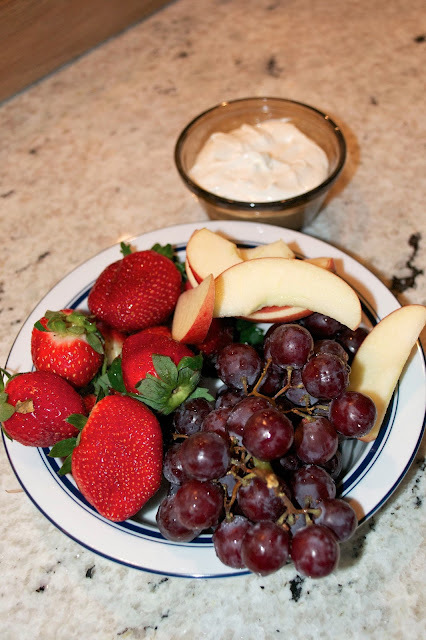 Just saw your link over at Six Sisters Stuff and HAD to come over and check out your recipe for this fruit dip! This looks so yummy! Think I have everything to make it... except for the fruit, lol! this looks and sounds like a fantastic fruit dip. Must try it. One of our favorites....sour cream and brown sugar...it is sooooo good...Give it a try sometime.